Join us as we hear about the stories of new Muslims accepting Islam in prison. 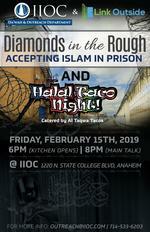 Join us for Diamonds in the Rough: Accepting Islam in Prison. Hear the real life stories of brothers and sisters that have accepted Islam in prison. We will also be having Halal Taco Night as well. Tacos will be catered by Al Taqwa Tacos. Kitchen opens at 6pm followed by the main program at 8pm. The views represented at the events do not reflect the views of UmmahNow. Please confirm venue's accuracy by contacting the organizers. 1220 N State College Blvd.